A while ago we went for a hike in the mountains and we came upon the ruins of an old hotel. It was a beautiful setting, built against the backdrop of a spectacular mountain. Not much remained of the hotel and nature was steadily reclaiming its foothold. Despite the dilapidation, life carried on. Wildflowers were growing in amongst the broken tiles of what used to be the foyer and butterflies were happily dancing from bloom to bloom. An orange tree was growing through the rusted window frame dangling from the corner of a disintegrating wall. It was eerie standing there in the silence of a mild summer's day. Our thoughts turned to the people who must once have crossed the threshold of this scenic little hotel, and somehow the sound of the laughter of long forgotten children was carried on the breeze. Standing there, I could not help thinking that it was like a metaphor of life. Sometimes it feels as if our perfectly planned and built lives have ended up in ruins. We feel all is lost, our foundations are crumbling and weeds are twisting and smothering our dreams. We look at the perfect lives of others, and we feel shattered and disillusioned. All our plans came to nothing. Our blueprints were nothing but castles in the air. We want to abandon the building. Yet, all is not lost, the wildflowers and butterflies are proof that life carries on, maybe all we need is a fresh look at where we are, at the good that surrounds us. Maybe we have to shift our gaze up towards the top of the mountain. 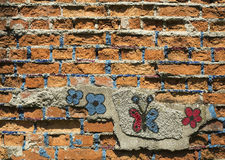 The truth is that what might seem like a ruin to us, may be the foundation of a more beautiful and stronger structure. It is an opportunity to learn and build something better. The question is: where do we start? First of all it takes a mind shift. Instead of looking at your life and your circumstances and seeing only the ruins and "failures", take note of the lessons learned and the all the possibilities waiting. Instead of seeing limitations, look beyond at the infinite horizon stretching out ahead. One thing that we need to learn once and for all, is that our old way of doing things did not work, so try a different approach. As Doctor Phil has often pointed out, it is foolish to do the same things over and over, but expect different results. We have to shift our point of view. I have to pledge to myself to build the life I dream of living one step at a time. Only I, myself, can do it. Nobody else can do it for me. There is no knight on a white horse, or a fairy godmother, who is going to come past and with a kiss or wave of a wand, change my life. I have to go out and catch that horse for myself and ride it. Next, let go of all the excuses you have lined up as to why you cannot start over, why you cannot achieve success and why you cannot do what you need to do. Let go of all your crushed hopes, your fear of "failing" again, negativity and destructive self-belief. You need to let go of all your past baggage so that your hands are free to grasp the new opportunities around you. Make peace with who you are. You cannot grow and develop as a person as long as you are at war with yourself. Develop your good points, your talents and your attributes. Write them down and celebrate them. Accept your less favourable characteristics and ask yourself which of those you can improve and turn around to become positive qualities and actively work on them. Acknowledge and forgive those things that you cannot change. Focus on your target. We all have dreams. Often we have so many dreams, that we do not know where to start. It is like walking into a confectionery shop and being overwhelmed by all the flavours, colours and textures of the various cakes, tarts, pastries and sweets on offer. If we do not at least have some idea what we would like to eat, we will battle to make a decision and usually end up wishing we had ordered what the customer at the table next to me is eating! It is the same with dreams for our lives. If we do not have a clear idea of what dreams we would like to pursue and for what reason, we often end up looking at other people living their dreams and wishing it were mine! We have to discover what dreams will satisfy our passion and our life's purpose. That has to become our target. Then we must focus all our attention on that one target, that ultimate goal. I have to know what type of building I want to build before I can start putting one brick on top of the other. Now, the work starts. I have to actively pursue my dream every day. I have to prioritize it and schedule it. I have to be relentless in reaching my goal every day. I have to fill my days with all aspects of my goal. Read about it, research it, do the things I need to do in order to get my plan off the ground and into production. Reach out to experts in the field and learn from them. Every day and every effort will bring you closer to your target. Never, ever give up!!!! It is very human to get tired and to feel like giving up when we do not see the results we are expecting or anticipating. We lose heart and become despondent. Now is the time to persevere. Be patient with the process, but also with yourself. Anything worthwhile always takes time. Have faith in your dream and faith in yourself. Never doubt your dream and do not let anything or anybody distract you from your dream. Know that in your pursuit of your dream, there will be ups and downs. There will be moments when everything will seem to go wrong, but, do not be thrown from the tracks, focus on your goal and take heart. The times of difficulties and setbacks will pass. It will always go better again. Never quit! Now, get to it, build your life, brick by brick, and do not forget to have FUN in the process!